Sometime in the mid 80s my mother started wearing slip on sandals that had spikes on them. I was horrified. Not only because they looked ridiculous but also because surely they hurt to wear and why on earth would anyone want to inflict pain on themselves with every step they take? My mother was an early adopter of health and wellness methods that we consider mainstream today. In the 70s and 80s she was more or less a hippie with a Phd. She was a meditator, a whole-foods cook and had regular acupuncture or chiropractic care whenever she needed it. She also smoked off and on and drank a lot of red wine. So I guess the rule-breaker gene is strong in my family! Fast forward 30 years or so and I find myself making the same health and wellness choices that she was making at my age. Holistic health is not a freaky way to live anymore. It’s not relegated to the weirdos who don’t wear deodorant or care to pay taxes (gross generalisation I know!). Living well in 2017 means taking into consideration every element that impacts the way your body works. And you don’t need a health science or physio degree to know that good food and exercise is key to keeping things tuned up; as is regular therapy of some kind for your mind and body. Therapies like massage, physio, chiropractic care, acupuncture, yoga, counselling…or my current favourite – online shopping! In the last two weeks I’ve purchased a swag of things to help get me tuned up. I wrote about brain fog a few weeks ago and all the products I’m trying out. I made one trip to the health food store but truth be told I put that off for a few weeks because I just couldn’t be bothered. I am inherently lazy – which accounts for my daily exercise routine, or lack there of! However when it comes to online shopping and home delivery I can work up a sweat with the best of them. Which brings me to my bed of nails. I am highly suggestible, meaning when I see or read about a product that is getting rave reviews, or let’s be honest, even just one review from a person I trust, I reach for my credit card just as fast as my swiping fingers can go. Having said that I’m not frivolous …I don’t own too many things that I don’t actually use, enjoy or gift. 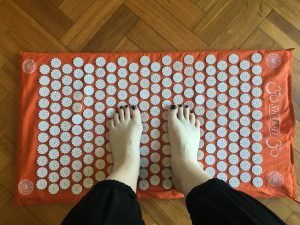 Last week I saw The Natural Nutritionist (one of my go-to health gurus) using and promoting the Shakti Mat…or as it’s lovingly been referred to a “the bed of nails”. It was a sponsored post, which is exactly the type of advertising that works for me. I trust Steph not to promote something that is crap. It immediately reminded me of my mother’s Maseur sandals and I knew it was something that I would benefit from. So less than five minutes after reading Steph’s post I’d placed my order online (and I was probably still in bed when I ordered it too). About seven days later my little package of nails arrived from New Zealand. The original Shakti Mat that I purchased comes folded in half in a little tote bag. Neat. 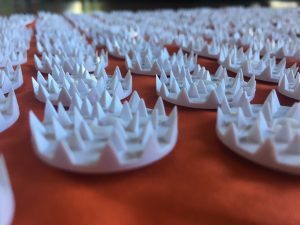 “The Shakti Mat is an acupressure mat designed to relax the body and calm the mind,” says the brochure that came with it. The brochure also told me that it is a Gratitude Temple Factory product, handmade in Varanasi, India by women who are paid well, work in good conditions and are provided meals each day, sick pay and free health care for their families. Something I didn’t know when I bought the product but that just added to my joy of having purchased it. Like I said, Steph doesn’t promote crap. As soon as it arrived I busted it open and lay it out to test it. It worked exactly like I hoped and trusted that it would. It was uncomfortable to start with but within moments I could feel tension easing and a sense of calm over take me as I relaxed into it. Just like a massage that hits the right knots. I’ve used it every day this week for 10 minutes here and there. I’ve gripped it with my hands for a few minutes to help release tension (I type a lot so my hands and forearms are always up for some TLC). I’ve had the mat flat on the floor to rest my shoulders and neck, which has done a magnificent job of chilling me out and easing tension. My feet are resting on it now under my text as I write this post. I can’t tolerate standing on it just yet. It definitely takes time to get used to it and experiences will be different for everyone (because we all have different levels of tension & stress) but the discomfort is worth seeing through because the results are fab! If therapies like this are your thing I can recommend a touch of online shopping to try it out. You’ll be doing good in more ways than one. The way you think, it is so like me!! This week, I ordered my vitamins (from steph) to be delivered, I have those shoes already, and I am 5 mins away from ordering the mat. So I am too scared to use mine and I have had it for months. I even got the most gentle version available but it honestly scares me. Maybe I just need to try it!